Designers of portable Li-ion battery-powered electronics now have a simplified and more flexible way to add a USB Type-C (USB-C) charging system to their products with the MAX77860 3A switch-mode charger from Maxim Integrated Products, Inc. (NASDAQ: MXIM). 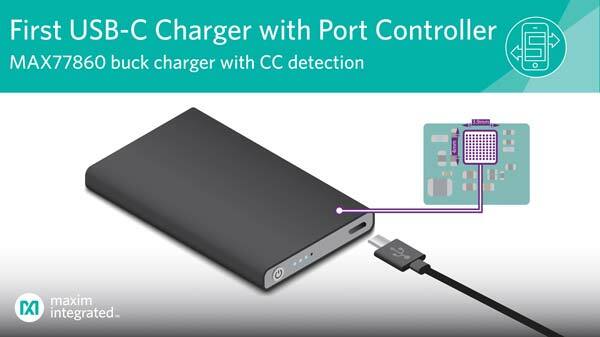 This USB-C buck charger provides the industry’s first integrated USB-C port controller and charger to eliminate the need for a separate host controller, simplify software development and reduce overall bill-of-materials (BOM) costs for applications such as financial point-of-sale terminals, power banks, industrial computers, scanners, radios, medical devices, charging cradles, portable speakers and game players. A wide range of consumer electronic devices are migrating to USB-C interfaces to support rapidly advancing communication and battery-charging capabilities, as well as smaller design size. In current designs, the host microprocessor is needed to detect the current level and configure the charger’s input current limit. While PCs, laptops and cell phones have driven early adoption, USB-C adoption rates are expected to grow at 8.5 percent a year through 2020 thanks to useage in other classes of portable devices, according to IDTechEx.